Below you can view all the homes for sale in the New Neighborhood/Old Davidson subdivision located in Davidson North Carolina. Listings in New Neighborhood/Old Davidson are updated daily from data we receive from the Charlotte multiple listing service. To learn more about any of these homes or to receive custom notifications when a new property is listed for sale in New Neighborhood/Old Davidson, give us a call at 704 604 8836. Located on Faulkner Square, a beautiful common area w/arbors & benches. MLS#3497515. Allen Tate Davidson. Enjoy all the conveniences that Davidson has to offer and make this beautiful home yours before it is gone! MLS#3492005. Carolina Real Estate Experts The Dan Jones Group I. 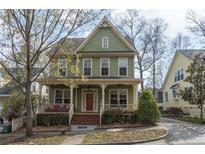 Very close to Davidson restaurants, shops, or weekend farmers market. Neighborhood info: http://stalbanssq.org/ MLS#3487674. Southern Homes of the Carolinas. This neighborhood has playgrounds, green spaces & off leash dog park! MLS#3488878. Allen Tate Davidson. Don’t miss this special, move-in ready home with mature shade trees and beautiful setting! MLS#3484164. Coldwell Banker Residential Brokerage. Enjoy all Davidson offers: Concerts on the Green, nationally recognized restaurants, lectures & sporting events at Davidson College. MLS#3481669. Keller Williams Huntersville. Close to shopping, dining, library and farmers market in downtown Davidson.. Home just started construction. Approximately 5-6 month for completion. MLS#3475574. South Creek Homes, LLC. Walk to town and enjoy shopping, restaurants, library and the farmer's market on Saturday mornings! MLS#3466144. Keller Williams Lake Norman. Exterior trim and siding painted 2017.New AC units (2017, 2018) MLS#3432979. Keller Williams Huntersville.